When fighting a zombie you need to take them down fast. But zombies are resistant to pain so many of the pain inducing techniques used in martial arts won't work. Putting a wrist lock on a zombie is just asking for trouble. Most zombie manuals will talk about destroying the brain and there is good sense in that. You are not relying on pain to control the zombie but brain damage to destroy it. Being a professional zombie survivalist you will want to know exactly which cranial targets will destroy, or at least stun, a zombie. So here there are. 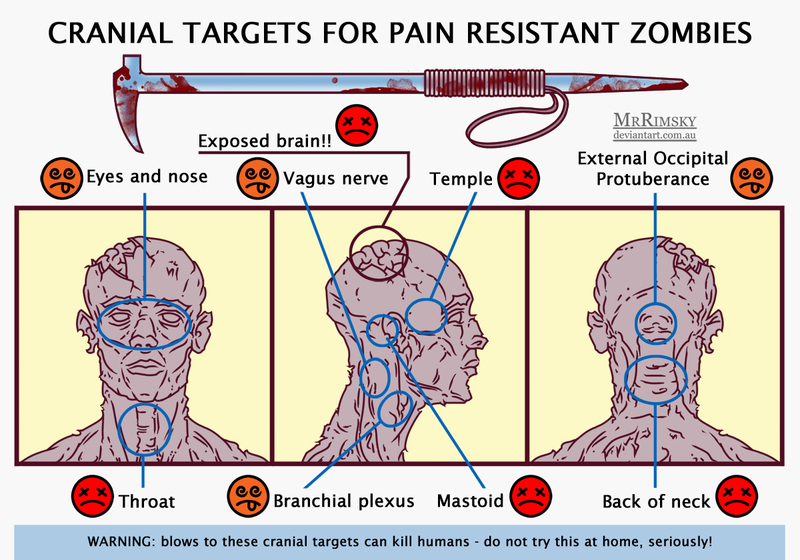 Impacts to any of these areas on a human can be fatal, so hopefully it will apply to zombies too. However life is unpredictable and a stunning blow to the branchial plexus may take out a zombie completely while another zombie may not even notice a hefty whack to the temple. There are no guarantees so be prepared for situations where it doesn't work the first time. In these situations there is a simple trick you can use, but that is another lesson.